(CNN) -- A terrorism suspect -- whose 2008 escape from Singapore launched a global manhunt -- has been arrested in Malaysia, according to authorities there. 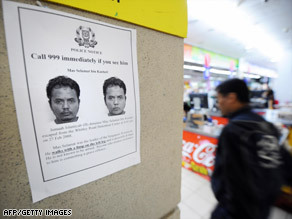 An public alert posted at a supermarket for Mas Selamat Kastari on March 1, 2008, in Singapore. Mas Selamat Kastari, suspected leader of the Islamist militant group Jemaah Islamiyah's Singapore arm, was arrested April 1 in Johor state in Malaysia, near the border of Singapore, Malaysian police said. Authorities have interrogated him and are sharing the information with police in the region, Malaysian law-enforcement officials said. "It's very good he's been caught, but it's important to remember there are many other fugitives still at large, not (the) least, Noordin Moh Top," said Sidney Jones, South East Asia director for the International Crisis Group. Noordin is a Malaysian thought to be behind the region's most recent major attacks. He belongs to a small splinter group of Jemaah Islamiyah that espouses the use of large-scale terror attacks to push for the establishment of Islamic states in the region. Noordin is a one-time officer, recruiter and bomb-maker for Jemaah Islamiyah, who police say has narrowly escaped their dragnets for years. In the case of Mas Selamat, thousands of security forces fanned out across Singapore after he escaped in February 2008. Interpol, the organization that helps facilitate cooperation among police agencies around the world, later issued a worldwide security alert for him. Mas Selamat had been arrested in Indonesia and turned over to Singapore, on suspicion of plotting to crash a plane into the country's airport. Jemaah Islamiyah is thought to have links to al-Qaeda and is suspected of being behind the 2002 nightclub bombings on the Indonesian island of Bali that killed more than 200 mostly Western tourists. Singapore is a strong U.S. ally and one of the world's most prosperous countries with strong international trading links. Mas Selamet fled the southeast Asian country in 2001 after authorities cracked down on Jemaah Islamiyah and arrested dozens of its members. To retaliate, Mas Selamet plotted to hijack a plane and crash it into Singapore's main airport, Changi, the Home Affairs Ministry said. The plot was not carried out. He also is suspected of being behind plans to attack the U.S. Embassy and a government building. Indonesian authorities arrested Mas Selamet on immigration violation charges in 2003. Three years later, he was deported to Singapore, the Home Affairs ministry said. He was being held under Singapore's Internal Security Act, which allows authorities to indefinitely detain someone without trial. Mas Selamet slipped away from a detention center in Singapore after asking to use the toilet before a visit with his family, Home Affairs Minister Wong Kan Seng told lawmakers in parliament 2008. Journalist Baradan Kuppusamy contributed to this report.